This is a party for a 1 year old, is he/she old enough? Any child that can sit up unassisted is old enough to ride a pony. A baby's first birthday is an ideal time to celebrate with their first pony ride!!! We need atleast 50 feet for parking our truck and trailer, please be sure to block off a space close to the area we are working at ahead of time. The ponies back off of our trailer and need enough space to turn around once they unload. A flat area for the ponies to be walked at. Access to a water spigot- a garden hose will work just fine or a sink inside of your home. Each child will have a different reaction to the animals. Our goal is to provide every guest with the best possible experience as they ride the pony- at times this may take all of our attention. We expect that, as hosts, you will assist us in our mission by keeping active ball play, loud noises and unsupervised toddlers to a minimum. What is the etiquette? How do i prepare the children? To maximize the pleasure you have during your event, you can tell your guests that the ponies will be happier without loud noises, sudden movements and that if you put your fingers in the pony's mouths, they can't really tell fingers apart from a carrot. Proper footwear is a MUST! Bare feet and any open-toe shoe are inappropriate. Our ponies weigh anywhere from 600-1000 lbs. Our ponies have these jobs because of their patience and love of their work, and this is reflected in their somewhat un-ponylike behavior. But please be aware, that ponies cannot see directly behind or in front of them. Can we feed the ponies? 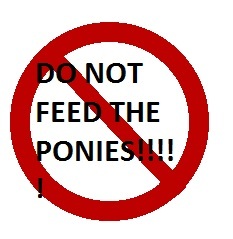 We ask that children/adults do NOT feed the ponies ANYTHING! Sometimes ponies can get "grabby" and nip a finger. Thanks for your understanding of our safety rules! Do you conform to health regulations? The ponies have all the standard vaccinations, deworming and dental care. This includes current negative coggins tests for crossing state lines and a yearly rabies vaccination. The USDA does not have jurisdiction over pony ride busineseses as they do with petting zoos, so licensing is not required. Horses and ponies do not transmit diseases to humans such as e. coli, salmonella or botulism- so stash the hand sanitizer, relax and enjoy! How do i know how much time to book? The rule of thumb is one and half hours with one pony per party of up to 15 children. This gives each child the option of atleast three rides or more depending on the size of your yard or area designated for the pony rides. Photo time is also a factor- for smoothest results, designate a party photographer to stand in one place and take each child's picture- great to send with thank you cards! For parties expecting over 15 children we advise adding an additional pony to keep the waiting down and to give the children even more riding opportunities!!! 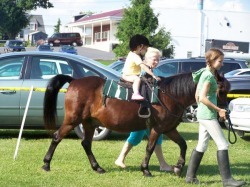 Yes, anybody can ride- but you have to make sure you book the right sized pony and/or horse for your event. If you book two ponies and the day of the party decide that you want grandma on for a picture, we can not accommodate you! 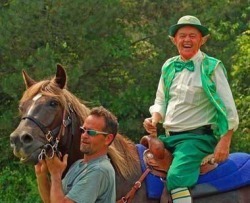 Pictured above, the Lucky Leprechaun at an Irish Festival took a spin on our beloved horse Tucker (RIP). 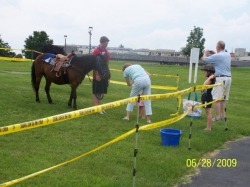 You have to make sure that you book the right-sized ponies/horse for your event! Is having pony rides a safe idea? 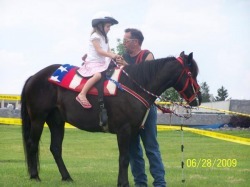 Our ponies are trained to walk at a slow speed and stand patiently while your child mounts and dismounts, although sometimes a hesitant child makes an impatient pony. You are welcome to walk alongside your child and it is urged when your child is under 5 years of age. Helmets are a MUST, if you or your child refuse a helmet we cannot allow them to ride. Our ponies are NOT "housetrained" like a dog. As soon as they make a "mess" we clean it up as soon as we have a minute. We do not wait until the end of your party/event and allow your guests to step in and track the "mess" through your yard or home. We have a "manure bucket" that we carry the "mess" away in, we NEVER leave any messes for you to deal with! It's winter- is it worth having pony rides? Normally the cold weather and combination of excitement and adrenaline pumping in young children is enough to warm the tiniest toddler. So as long as it isn't excessively windy, your children will enjoy the novelty of our fuzzy ponies. What is the difference between a pony and a horse? As you see in the picture, there is a difference in the size of each one of the "equine" in the picture. On the left is Lucky, he is 12 hands or 36 inches or 3 feet tall to his withers. 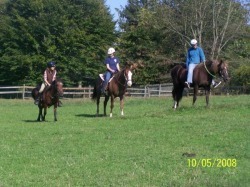 The pony in the middle is 14 hands or 56 inches or 4'8" to his withers and the horse all the way to the right is 16 hands or 64 inches or 5'4" to his withers. This is how we measure ponies and horses. Ponies are typically 58" and under.